Planning The Perfect All Inclusive Wedding. The Travel Insider Shares Our Secrets To Making That Perfect Day Perfect. The all inclusive wedding can be just perfect. More and more the all inclusive resorts have upgraded and improved their wedding packages. For example, Sandals calls it’s all inclusive wedding products "Weddingmoons." Many all inclusive resorts offer a complementary wedding package in exchange for a minimum stay. If your dream is a special wedding on the beach, today’s all inclusive resort is your answer. The destination wedding is more popular then ever. 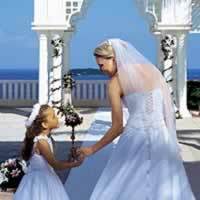 The primary reasons all inclusive wedding has become more popular is the ease in planning and cost. Today brides are more likely to have full-time jobs and don't have the time or the inclination to spend a year planning a wedding. Not to mention the financial factor. It's a lot less expensive to fund a small wedding in the Caribbean or Mexico than a large hotel affair in a big city. People are more mobile these days. A hometown wedding is more of a rarity. The mind-set is, if relatives and other guest are going to fly to a wedding, why not have them fly to a tropical wedding in a gorgeous location and have several celebrations instead of just one? The destination wedding has always been big with couples getting married for the second or third time. Typically, our clients don't want a big affair, but rather something small that they can share making the all inclusive resort wedding perfect. Our number one suggestion to the perfect wedding is work with a travel professional. Don’t do alone. The Travel Insider wedding specialists are here to help. Our help is free for all wedding parties booking their travel with our office. The top eight wedding planning questions from our clients. Is the all inclusive wedding a legal marriage, recognized in our state or country? Absolutely. Virtually all resorts offer several locations at each resort, and the beach is always an option. The Wedding Coordinator at the resort will give you a tour of the possible locations and help you pick the perfect one. Any arrangement for transportation of a wedding dress should be discussed directly with your airline carrier. Most brides choose to pack their wedding dress in a separate carry-on garment bag and take it with them on the airplane. My dress made it. Does the resort offer a steaming or pressing service for the wedding dress? Most resort have arrangements with an off property service that will handle the steaming of the dress. Prices are determined on the size, detail, and material of the dress. Generally upon arrival, clients will receive a letter from the wedding coordinator in their room or front desk with an appointment time and date to meet with the coordinator. Are there any special requirements about getting married in another country? Each country requires that you ‘reside’ in that country before you can get married. For example Jamaica has minimum stay requirement of 48 hours before couples can marry. In addition certain government documents must be prepared and fees($200.00 on average plus a fee to the wedding official performing the ceremony) must be paid that are over and above the resort charges. The documents process can be a confusing and complicated one, but we rely upon the resorts wedding coordinator to make the process as simple and as stress-free as possible. Remember that each country is unique and requirements vary drastically from country to country—sometimes changing with little notice! Your resort’s wedding coordinator can answer any questions you have about the documents required for each country. The experience of having your wedding on a gorgeous, tropical destination is well worth the effort! Flower bouquets are generally chosen on property. Flowers cannot be imported or brought with you for your wedding. All resorts provide a selection of music. However, clients are welcome to bring their own wedding music CDs.